Following instruction one, we move more into my philosophy of how Pool Billiards should be played, which also incidentally pretty much sums up life in general. Keep it simple! Billiards can play tricks on the mind, so it is important to have clear strategic objectives from the start. Remember instruction one? Pot the ball. Well it’s the same for instruction two. By keeping our game simple we can then begin to master all ‘elements’ surrounding Pool Billiards. Diagram one shows a rack of 9Ball at the stage of a basic 3 ball layout. By only using the stop shot to run out, we eliminate the risks of (i) Missing shots (ii) Miss cueing (iii) Running out of position (iv) Generally making a total hogwash of the rack! Follow illustrations 1-3 to complete. Try practicing diagram one, only using the stop shot. Practice Conclusion: What did you discover whilst practicing this drill? More importantly, what did you discover when you set this drill up for a second, third time and so on? Did you notice the shape alignment of the balls? TRIANGULAR FORMATION: More times than not, any three ball layout will be in some form of triangular formation. It is very rare to have three balls on a pool table that do not form a triangular formation. So good basic practice is to learn and master these triangular formations. This is the essence of basic pattern play, and the more we practice the better we become at recognising these patterns. Pattern play can be learned over time and is the by-product of repetitive practice, actual play and familiarisation. A more complexed understanding of ‘seeing patterns’ on the table takes years of rudimentary understanding, however I will discuss and seek to speed up this process in the tutorials ahead and will introduce and discuss triangular formations in greater details as we progress. In the rare case that all the balls are lined up we can still play the stop shot with minimal effort, but with maximised results. Diagram two; shows how you can play the stop shot in order to successfully run out. Note: The first shot of this run out is the most important. 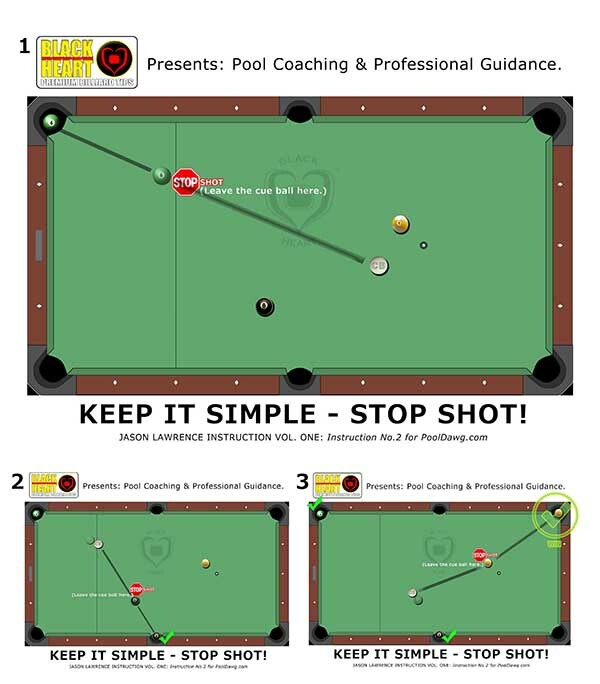 Keep it simple, to minimise scratching the cue ball in the middle pocket. Using your stop shot technique, hit a simple shot into the pocket with the cue ball and object ball slightly off line. See what happens? This is called a Stun Shot and is a very important type of stroke to learn and master. The stun shot can keep the cue ball under control in many situations, once mastered! ELIMINATING PRESSURE: As a result of keeping our game simple, we begin to eliminate the outside elements and pressure that can build up inside us when we strive to outwit and defeat the opponent. Always hit the cueball dead-centre and always follow through with your cue action. Try a range of shots from short, medium, too long. Listen to the way the objective ball hits the back of the pocket. This will indicate and teach you about hitting the ‘Sweet Spot’ of the cue ball. Remember, practice will not make you perfect. Practice can only make you better! The importance of good practice is to practice the right way and enjoying each practice session. TIP OF THE DAY: Practice as you would play, play as you would practice.